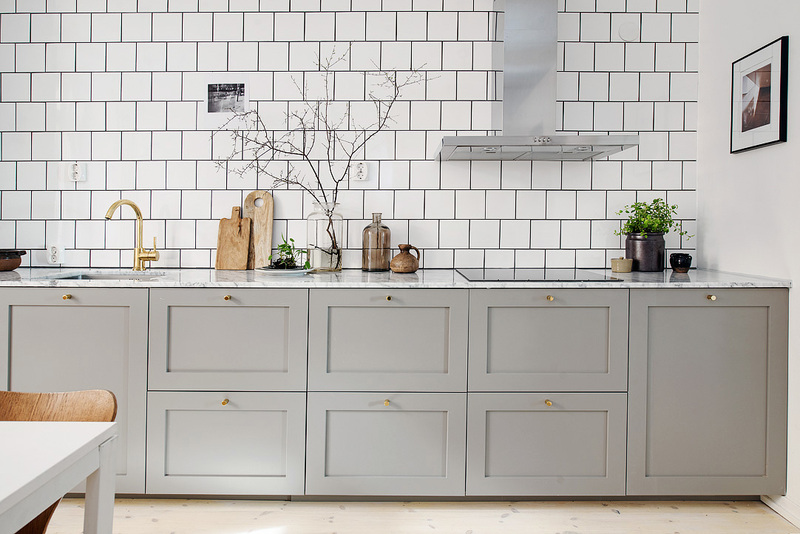 One way to warm up the popular cool gray and white kitchen palette is to add a warm brass accent. For the past few years, I’ve seen brass looking very fresh in the kitchen. Its as if designers turned to brass after tiring of the pale look of nickel and chrome for faucets and kitchen hardware. Seeking an alternative to the dour look of oil-rubbed bronze, the golden pop of brass looks glamorous in an otherwise conventional gray and white European apartment kitchen. 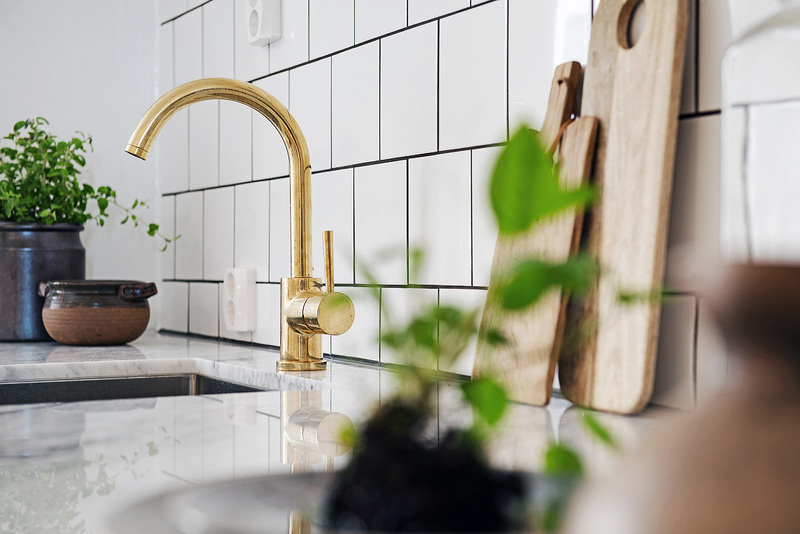 The modern brass faucet isn’t exceptionally large and it’s a familiar design, modeled after the Dornbracht Profi faucet, that’s become so standard. Yet it manages to make a statement— even though technically metallics are neutral. Using brass cabinet hardware to back up the faucet is a logical choice. Tubular pulls have a clean, modern design and a sculptural quality as well. 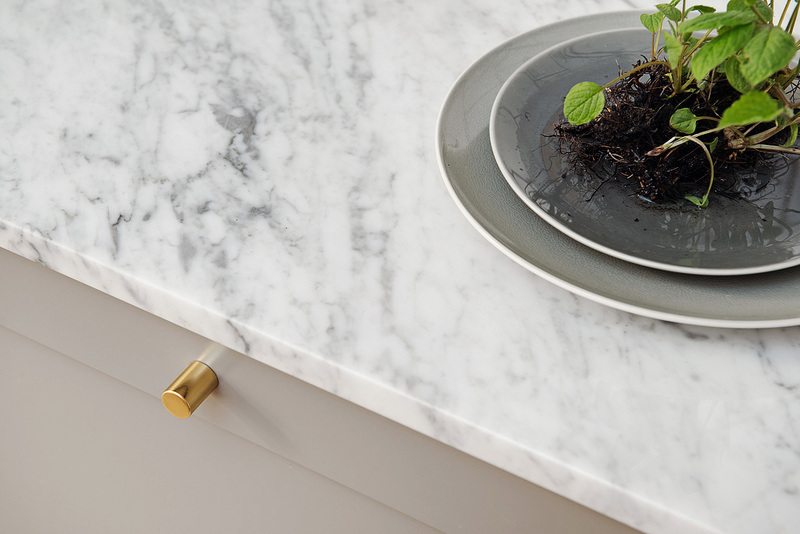 They work with the gray-painted cabinet finish and with the Carrara marble counter. Although that might be stating the obvious, the point of showing a kitchen is to share thoughts about what works and why. 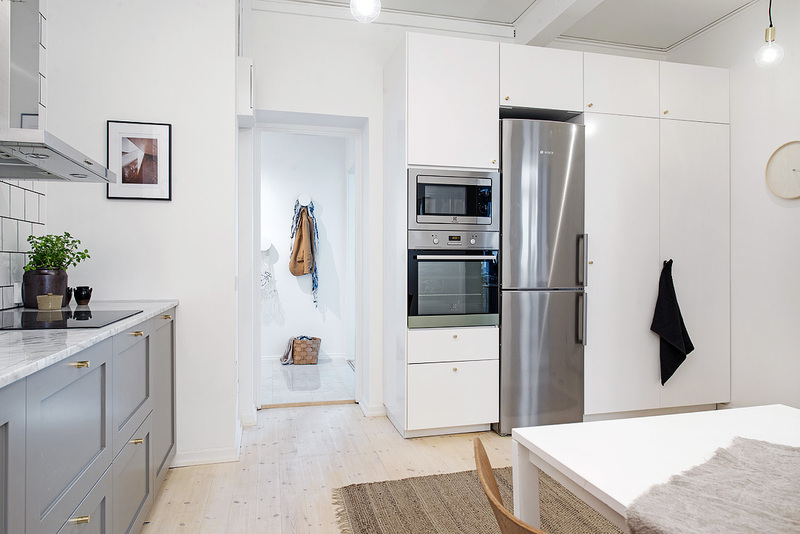 Due to the construction of pre-20th century buildings, European apartment kitchens like this one often have the sink and cooking surface on the same wall. That arrangement is considered a no-no to the Americans who insist the best relationship between sink, cooktop and refrigerator is the “work triangle.” Here, the relationship between the sink and induction cooktop is linear but clearly functional with sufficient space in between. Likewise, instead of chopping up the wall up upper cabinets, what I refer to as a Eurosplash — tile from counter to ceiling — helps give this wall a clean, uncluttered look. Large scale, staggered square field tiles are set with dark grout for full definition. And the chimney hood is properly lined up. The only question here: where’s the dishwasher? My guess is to the right of the cooktop. Or perhaps there isn’t one. Sometimes we don’t get alternate views of a kitchen space. Here, the regular and speed oven are stacked on the end of a storage cabinet wall. I’m not fond of placing a refrigerator next to heating appliances and, for me, this 24” Liebherr column looks squished into the cabinet. This view also gives us a look at the pine loor which has an unusual whitewashed finish. On the other hand, the underlying warmth of the pine works very well with the brass accent hardware. Subtle, no?